Operation Finale: The Capture and Trial of Adolf Eichmann is the name of the traveling exhibit. Adele Besserman, 88, is a survivor of the Holocaust. She was 9 years old when her family fled to Russia to escape Poland. Armin Krauss, left, came to the opening with his son, Michael Krauss, right. Armin, from Hungary, survived shoveling bricks and sand at concentration camps. His wife was an Auschwitz survivor. He speaks at the Center now. The exhibit will be in Dania Beach through the end of March, before it travels to the World War II Museum in New Orleans. Avner Avraham - a former officer of Israel's intelligence agency, Mossad, was one of the curators of the exhibit. "[This is] One of the most famous and important trials ever," he said. "Of course, it's related to the Holocaust and the Jewish people." More than 60 survivors of the Holocaust came to the opening, including Adele Besserman, 88. She was 9 years old when the Holocaust began and she was able to escape from Poland with some of her family to Siberia. Now, she lives in Hallandale Beach. "It reminds me of my friends," Besserman said of the exhibit. "Some of them are gone and some of them I still see, but it reminds me of them." Julius Eisenstein finds his picture that is featured in the exhibit. 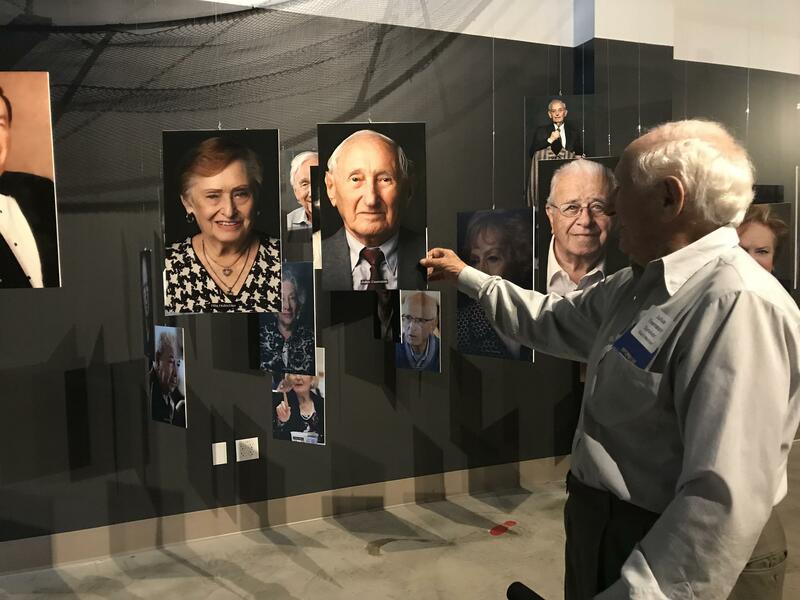 The ending of the traveling exhibit was customized to show local, South Florida Holocaust survivors. The exhibit also brought back memories for Julius Eisenstein. He was 19 years old and living in Poland when the war started. He survived both Auschwitz and Dachau concentration camps. Now he's 99 years old, and also lives in Hallandale Beach. He hopes the story of how Eichmann was captured will help people never forget what he and so many others went through. "People should recognize, should see actually what happened," Eisenstein said. "Here they can get some idea of what happened, and they should fight for the rest of their life not to let that happen again." Correction: The original version of this story identified Adolf Eichmann as Adolf Eichman. We regret the error. Halina Litman Yasharoff Peabody remembers the events of her life during the Holocaust in remarkable detail. She was only 6 when Russians invaded her Polish town, arrested her father and sent him to a prison camp in Siberia. The Germans arrived in 1941, setting off a string of horrors for Peabody, her mother and her baby sister: the hiding, the ghetto, the mass graves, the escape by train and the bomb that took two of her fingers. Editor's note: Since we published this story on Dec. 12, 2017, Kalman Aron, the artist featured here, died on Feb. 24. He was 93. When you step inside artist Kalman Aron’s modest apartment in Beverly Hills, a lifetime of creation surrounds you. The walls are covered in paintings and finished canvases are stacked on the floors, a dozen deep. The paintings range from portraits to landscapes to abstract works. They’re just a fraction of the roughly 2,000 pieces Aron says he’s created over the decades.